This weekend we took our cocoa bean roasting to the next level: we christened our newest tool, the Behmor 1600 Plus! And already, we’re very happy with the investment. Thanks Dave Huston & John Nanci for recommending it! This is the most technologically advanced piece of equipment we own for chocolate. And it comes with TWO instruction manuals, both of which I’ve read cover to cover multiple times and referred to throughout our first roast. Originally made for coffee, this roaster has come up in conversation with our coffee-addict friends (ahem, Kevin) more often than we expected! What we’ve learned from friends (Dave Huston, John Nanci, Eli Curtis and others), is that the cocoa bean adaptation is not hard. In fact, the advice we’ve gotten is that the best route is to double the coffee quantity and the best roasts are when the rotating drum is full. Not too hard at all! After going through a clean cycle (which we had to try 3 separate times – the automatic-off safety feature surprised us a couple of times, but we’ve learned our lesson now), we tried our first batch. One of the operations manuals recommends starting with a small batch, just in case. The options on the machine are 1/4 pound, 1/2 pound, and 1 pound. That said, John Nanci recommends 2.5-3 pounds per batch. We combined the recommendations and put in 250 grams, just over a half pound. It doesn’t seem like much, but for a first batch, we’ll keep it small. There are many many options for what the roast cycle should look like. Check out this Chocolate Alchemy post for the 5 temperature & timing cycles and more information on the Behmor 1600 Plus. We were roasting Madagascar beans and the manual recommends P3 for any African coffee beans. We know that’s a bit of a stretch, but we went with it. We’ll probably try the hotter program (P2) with more beans in the future, but I’m pretty proud of round 1 for now! And let me tell you… it smelled amazing, especially as the roasting cycle drew to a close. We listened to the popping of the shells when the timer hit about 2:30 minutes remaining. And we watched the temperature stay relatively low for most of the roast, then rise to just over 300 right at the end, before the cooling cycle. We let the 8 minute cooling cycle run when the roast was over and just before it ended, I started to get that back of the throat sensation that John Nanci tells us means the roast is almost overdone. When we were done, we emptied out the dust tray and put it all back in the roaster – so easy! The resulting beans were cooked all the way through, unlike anything we’ve ever done in our oven, especially the Venezuelan beans we tried to match to John Nanci’s roast. The shells came off almost whole and the crunch from the beans told us they were definitely done. Bottom line, we highly recommend the Behmor 1600 Plus! What are your favorite ideas for roasting? And now we’ll winnow away those shells and start a batch in the Premier Wonder Grinder… Look out for some exciting posts on winnowing coming up soon! Last month, we visited John Nanci, the Chocolate Alchemist in Oregon. It was a lot of fun and we learned a ton about his process, ingredients, and recommendations! One of our favorite parts of the visit was roasting a batch of cocoa beans with him. Check out our previous posts on roasting here. We picked out the beans after sticking our heads in all of his big barrels of beans and smelling the wonderful scent of raw beans over and over again. I wish I could share smell through this post, because it’s incredible how different (and delicious) each barrel smells. We decided on the Venezuelan Carupano Corona, 2014 harvest, which has a savory, almost spicy scent. In the meantime, John had turned on his homemade roaster to start heating it up. This incredible device has two coupling thermometers which show the temperature inside the cylindrical drum of beans and outside the drum, where the heat originates. He filled the canister with about 5 pounds of beans and when the roaster hit about 400 degrees, he put on his heat-protective gloves and lowered the drum into the roaster. He closed the top and we started to chat. Let me set the scene… we’re in an open garage/workshop with a misty rain keeping the humidity high, though temperatures were likely in the mid-50s. Everything in the workshop smells like a part of the chocolate-making process: from raw beans to the brownie smell of roasting to the almost syrupy smell of undeodorized cocoa butter. As as chatted, every once in a while, John would pause, waft some of the rising hot air from the roaster over toward him, and comment on the smell. He glanced, every once in a while, at the coupling thermometers to gauge the difference between the temperature inside the bean canister and outside in the roaster, but the majority of his conclusions about the progress of the roast happened through his nose. He got excited when the smell seemed to waft over to us suddenly, letting us know that this is typically the peak of the roasting process. Around that time, we lowered the temperature and eventually he turned the roaster off entirely as they continued to roast. And he pointed out again when the smell shifted from our noses to the back of our throat. That was when he recommended taking them out. He waited even a few more minutes before pulling out the drum, dumping it onto his cooling table, and aiming a fan at the beans. He emphasized that, unlike coffee, cocoa beans have more forgiving roast potential. In other words, if you leave them in too long, they are less likely to become disgustingly over-roasted than coffee beans. In fact, he made sure to point out that it is difficult to over-roast cocoa beans. To be honest, this whole process was like watching a magician at work. His enthusiasm was contagious and Richard and I understood the intent but couldn’t necessarily recreate the magic in our own noses and throats. That’s why we decided to attempt to match the roast. So, we brought home those roasted beans as well as a few pounds of the same beans, unroasted. And over the weekend, we brought out a bottle of wine and the two batches of beans, and did our best to recreate the process. And – believe it or not – we’re not quite as good as the Alchemist himself! Unfortunately, we were both recovering from a cold, so our sense of smell wasn’t quite up to snuff. We used our relatively old oven, not a self-engineered roaster. The temperature in our apartment was in the high 60s and not at all humid, compared to John Nanci’s colder, humid garage. Stir the beans regularly. That could avoid “tipping.” Tipping is when the part of the bean touching the hot pan will roast faster (and potentially burn) than the rest of the bean. It develops an uneven roast and could add extra toasting flavors to the chocolate. His other brilliant advice wasn’t possible this time. He suggested doubling the pans, so there’s a more even distribution of heat on the bottom of the beans. However, we have exactly two pans and used them both for this roast, so we’ll need to try this next time. We flipped the beans after 5 minutes and at 10 minutes, we started hearing the snapping in the oven and the smell of brownies pervaded the apartment. The taste of the beans at that point was still quite raw and chalky, but the cocoa mass felt softer than a fully raw bean. We dropped the temperature to 250 at 10 minutes and by 12 minutes, it smelled like dark brownies and we started to get the sense in the back of our throats. We reasoned that they couldn’t possibly be done yet, and took John Nanci’s words to heart… it’s very difficult to over-roast cocoa beans. At 14 minutes, we flipped them again and at 20 minutes tasted a second time. This time, they tasted bland, almost nutty, without much flavor development. At 22 minutes, we pulled them out and did a full flip of the beans with a spatula rather that stirring them around in the oven (Richard advised me that I wasn’t flipping quite right, so this would be a more robust flipping system). We compared the taste to John’s beans at this point (starting to get giddy eating so many beans) and noted that ours tasted chocolatey and rich but the texture still felt raw – hard and not crunchy yet. At 26 minutes we pulled out a really bad bean that tasted underfermented; not particularly helpful in our comparison. A minute later, we found a good one that tasted pretty toasty and nutty. We compared it to John Nanci’s beans and noted that his had more flavor at the end, almost caramelly. At 28 minutes, we pulled out the tray to flip and put it back in 2 minutes later. As I flipped, Richard tasted and at exactly 31 minutes, we pulled out all the beans determining them definitely done, if not overdone! We quickly used Richard’s brilliant newly engineered cooling system for about 15 minutes until they felt very cool. And the result – our beans definitely taste different than John Nanci’s beans. Ours taste a little over-roasted and slightly bitter at the end, while John’s beans have that caramel finish. Whew, we’ll try again next time! Any suggestions from the audience on how you train your nose for the perfect roast? It’s been about 8 months since we starting playing around with chocolate. And in that time, we’ve collected quite a bit of equipment, tools, and ingredients that now fill an entire area of our apartment. We like to call that area our Chocolate Factory. 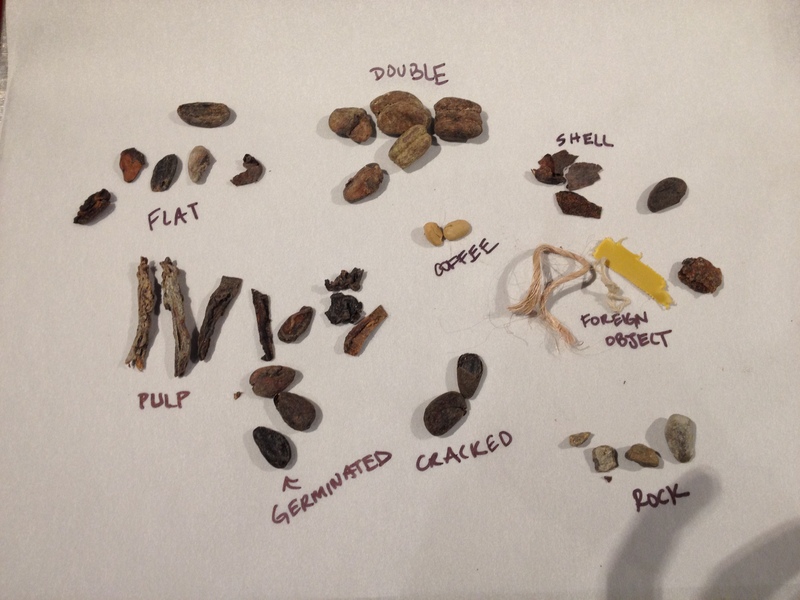 We started with just a bag of cocoa beans from the Grand Central Market in LA and some white cane sugar. From our very first coffee grinder to the old fashioned grain mill to the melanger we use today, we’ve gone through more than a few iterations of our process. I’d like to show off a little about our current set-up, in the hopes that it will be useful to other chocolate-makers or aspiring chocolate-makers out there! Let’s start with our documentation board. Here’s where we keep track of our batch sizes, temperatures, and results. We also keep a list of interesting R&D ideas that come to mind. Then we have our new peg board system that Richard built from Home Depot parts, where we store tools like thermometers, spatulas, molds, and safety goggles. We’re also intending to try out a new storage method for our finished chocolate. The Rubbermaids are drying out after an initial cleanse before we stuff them with chocolate bars! And finally, the beautiful homemade quartz table is for tempering. Here we have our current chocolate storage system. Have I mentioned we’re in the market for a wine fridge? We realize this method isn’t quite sustainable at our rate of churning out delicious chocolate bars! What’s a chocolate factory without some fun decorations? Check out our map, where we intend to document the origins of the chocolate we’re producing. And this is our awesome cocoa bean bag given to us by John Nanci of Chocolate Alchemy, when we visited Eugene last month. Here’s our fun bean cooling station, handmade by engineer Richard. I’m excited to use this for our next batch! Our shelves full of tools, beans, and documentation, are topped by our beautiful Premier Wonder Grinder, one of the key pieces of equipment in our process. We also have a gorgeous marble display slab, which we bring to parties to show off our different varieties. Our winnower, still very much a work in progress, has developed since the last time I photographed it. We now have an additional entrance spout and a much stronger shopvac than our home vacuum. Hold onto your horses, because a guest post from the engineer will provide more detail on the winnower soon! And last but not least, a good chocolate factory must provide inspiration and guidance to its chocolate-makers. Take a look at our chocolate library to see what we’re reading these days. The books lean heavily toward entrepreneurship & chocolate science! What does your chocolate factory look like? As I’ve mentioned before, even if your factory is just a coffee grinder and paint scraper, you’re a chocolate-maker in the making! And the exciting part – John Nanci roasted them right there in his workshop with us watching (and smelling) on! In his homemade roaster with temperature gauges inside the drum roaster and in the oven itself, these beans smelled amazing. I’ll write another post just on his roasting style and tricks, but for now, suffice it to say that it was quite an experience! With these beans that Richard describes as spiced, we’ve made our most recent batch of chocolate. Since we brought them back from Oregon in our suitcases (we’re shocked that TSA did not even double check our bags full of cocoa beans), they had almost 5 days to cool after being roasted in Eugene. We used the winnower Richard has been working on (guest post to come soon) with a slightly lower vacuum power and ended up with an incredibly 80% yield of nibs! We did a little hand sorting after roasting, which resulted in this beautiful picture (if I do say so myself!). We put the 802 grams of nibs into the Premier Wonder Grinder at 7:45pm on Wednesday night and added 283 grams of sugar as soon as the nibs had taken their liquid form. Thanks for the advice in your comments, Dave and Olivier and Ritual Chocolate! The grinder ran overnight, smelling delicious and creating that white noise that puts us to sleep. Thursday evening, we added the two new ingredients – soy lecithin (0.9 grams) and cocoa butter (50 grams) – and waited another hour and a half before pulling out the chocolate to temper. With these ingredients, our final chocolate is 75% cocoa mass + cocoa butter, assuming a 50% cocoa butter content in the beans themselves. See more on our two new ingredients here. Venezuelan chocolate liquor – yum! Tempering is now the trickiest part. I brought the temperature up to 128 in the microwave, then lowered it to 122 by stirring continuously before pouring it onto our tempering table. I agitated the liquor (which was quite liquidy) for maybe 5-10 minutes while it dropped in temperature. It dropped to 82 on the tempering table and I raised it quickly to 90 with just a few seconds in the microwave. Then, I poured the liquor out into the molds, filling them faster than we’ve done before and shaking them by hand to raise all the tiny air bubbles. The final product – 947 grams of 75% Venezuelan chocolate! The final taste is amazing – almost savory with the fruity spicey flavor of the beans coming through and the mellow earthy tones from the cocoa butter. The texture is crisp and smooth – no grains and with a solid break. Visually is where we’re still having issues. As I mentioned earlier in the week, the lecithin and cocoa butter did not prevent the white swirls of fat bloom from occurring. I felt great about getting the temperatures right the first time. *exact prize TBD, but it might just be a shipped sample of our finished chocolate of your choice! Last weekend, Richard and I had the opportunity to travel to Oregon. The long weekend took us outside of our comfort zone and into a land of beautiful scenery, lots of rain, and delicious chocolate! We spent one night at a funky off-the-grid community, where we slept in a one-room cabin with a wood-burning stove. We spent another night in a tree house hotel called Out and About Treesort, where we slept in a tree. Both locations had shared kitchens, minimal luxuries, and no cell phone reception. It was amazing to go off the grid and disconnect for a little while! We also checked out Crater Lake in a whiteout snow storm, visited Deschutes Brewery, hiked around waterfalls near Portland, and attended a performance called Cirque Zuma Zuma, showcasing African performers in Bend. You’re probably wondering what this has to do with chocolate. Well, during our trip, we also were honored to visit John Nanci, the Chocolate Alchemist himself, in Eugene. We also met Sebastian of Cocanu and explored the amazing chocolate museum/store, Cacao in Portland. We picked up Clay Gordon’s book and a craft chocolate tasting kit at Powell Books and brought home some Taza stone-ground chocolate rounds and a Lille Belle Farms (southern Oregon) bar made of chocolate aged in whiskey barrels! I’ll be posting about our adventures and what we’ve learned from our travels in the days to come. Look out for posts coming on our newest batch of chocolate, on the varieties of cocoa beans we picked up from John Nanci, on updates on roasting and tempering, and on new mystery ingredients we may be adding to our chocolate soon!